PITTSBURGH & CHICAGO--(BUSINESS WIRE)--Jun. 26, 2018-- Cheese lovers, say “Cheez!” Top hats off to those who started petitions, created online groups, and wrote snail mail letters asking Planters to bring back their favorite cheesy snack. 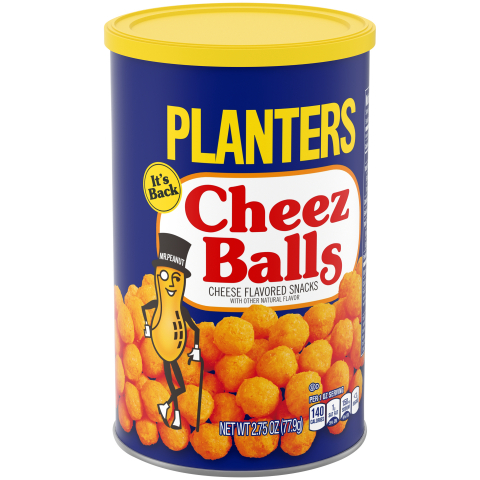 Thanks to their dedication over the past twelve years, Planters announces the return of Cheez Balls and Cheez Curls for a limited time. Beginning in July, fans everywhere will have the chance to purchase their own Planters Cheez Balls and Cheez Curls for a limited time. Planters Cheez Balls are sold in 2.75 ounce canisters and Cheez Curls are sold in 4-ounce canisters and will roll out on grocery store shelves nationwide starting at a suggested retail price of $1.99. To kick off the return of Planters Cheez Balls and Cheez Curls, Mr. Peanut teased the internet by hiding the first 59 available canisters across the internet for fans to find and satisfy their 12-year-old cravings, creating social media speculation about whether or not Cheez Balls would be relaunched. The lucky winners found the canisters on popular auction and e-commerce sites this last month within 24 hours, proving fans will do anything to try their favorite snack again. This week, Mr. Peanut is rewarding a few of the fans who went above and beyond to help bring Cheez Balls back by giving them one of the first deliveries of their favorite ‘90s snack. Fans will be able to follow the deliveries and see more about Planters Cheez Balls and Cheez Curls on Mr. Peanut’s social channels. The Kraft Heinz Company (NASDAQ: KHC) is the fifth-largest food and beverage company in the world. A globally trusted producer of delicious foods, The Kraft Heinz Company provides high quality, great taste and nutrition for all eating occasions, whether at home, in restaurants or on the go. The Company’s iconic brands include Kraft, Heinz, ABC, Capri Sun, Classico, Jell-O, Kool-Aid, Lunchables, MaxwellHouse, Ore-Ida, OscarMayer, Philadelphia, Planters, Plasmon, Quero,Smart Ones and Velveeta. The Kraft Heinz Company is dedicated to the sustainable health of our people, our planet and our Company. For more information, visit www.kraftheinzcompany.com.